How to make the world's best apple pie! An Easy, But Delicious Chocolate Yule Log Perefect for Christmas or New Year's! The chocolate Yule log cake is impressive to look at and delicious to eat. But what proimpted people to make a cake that looks like a log? A Chocolate Christmas Yule Log or a traditional B�che de No�l ("Yule log") is a dessert served during the Christmas holidays in the United Kingdom, France, Belgium, Quebec, Lebanon and several other Christian-populated countries, with ever-growing popularity in the United States. The cake is made to resemble a log ready for the fire. 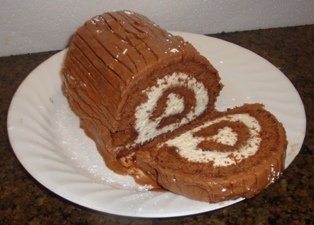 The traditional Yule Log is made from a sponge cake (Genoise, also called a Swiss Roll in the U.K.) generally baked in a large, shallow baking pan, frosted with 1/4 inch to 1/2 of either a chocolate or whipped cream filling (or in some cases a chocolate buttercream filling), then rolled again to form a cylinder, and iced on the outside with a chocolate icing (frosting). There are many variations on the traditional recipe, including chocolate cakes, ganache, Nutella filling, mocha and espresso or other frostings and fillings. 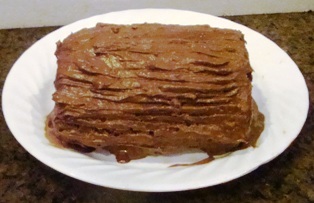 Yule logs are often served with a portion of one end of the cake cut off and set on top of the cake to resemble a chopped off branch, and bark-like texture is often produced in the buttercream or with chocolate flakes, for further realism. These cakes are often decorated with powdered sugar to resemble snow, tree branches, fresh berries, and mushrooms made of marzipan or meringue. Click here for the easy to follow Chocolate Yule Log recipe!